Dèesse Magazine: Marsala Holiday Inspiration !!! Getting on trend with Pantones Chicest Color of the Year Yet. Marsala Holiday Inspiration !!! Getting on trend with Pantones Chicest Color of the Year Yet. I just can't get ENOUGH of Marsala - the Color of 2015 . So today I decided to put together some great items together (some old, some new) that will help you get on trend for the new year. Wet n Wild Lipstick in 918D Cherry Bomb - The best collection of bargain lipsticks, and Cherry Bomb is spot on in the Marsala shade. Smashbox Be Legendary Long- Wear Lip Lacquer in After Dark - pigment and a lacquered finish ( win - win situation). This will be a great stocking stuffer for your girlfriends! YSL Eyeshadow ( this is a old one the name is removed - yikes!) - any shadow in a similar shade will do. Mally Beauty City Chick Smokey Eye Kit in Midtown Merlot - this has been one of my favorite smokey eye kits to use out of all of the ones I have. Nice to use this wine shade in place of the typical black shadow for a smoked out eye. Tarte smolderEYES Amazonian Clay Waterproof liner in Fig - this looks amazing on the lower lid as a pop of color on a neutral eye. Can also be used on the whole eye as a quick smudged/ smokey look. 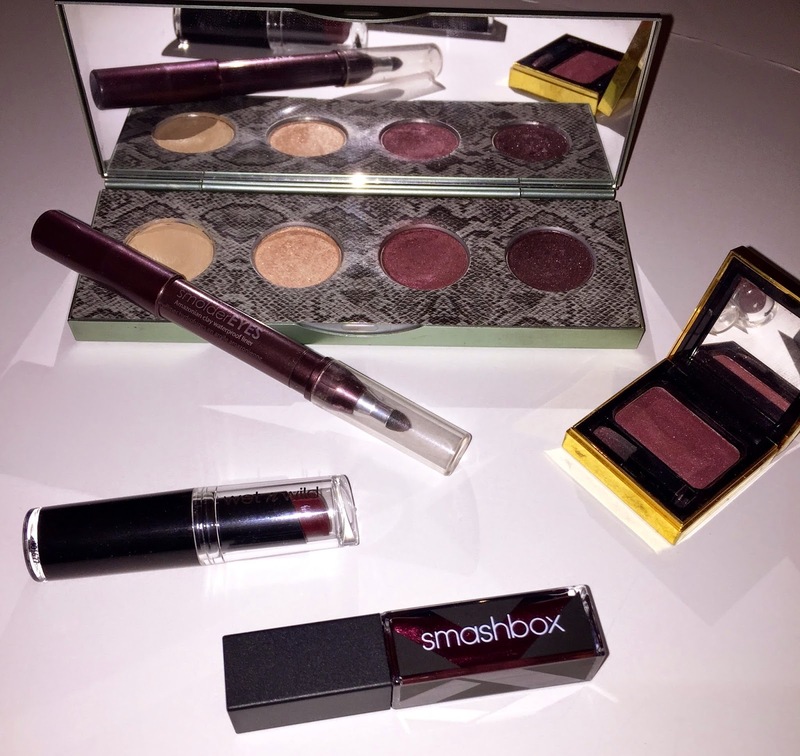 Paired with a lipstick / lip gloss , you have the perfect lil' gift set for the holidays. Hope you enjoyed this little collection I've put together, and for more fun finds you can check out my instagram.